It is definitely the most anticipated night in Santorini every summer. It used to be celebrated in mid-August but over the last years, this changed to mid-September. So, lucky you visitors of September. 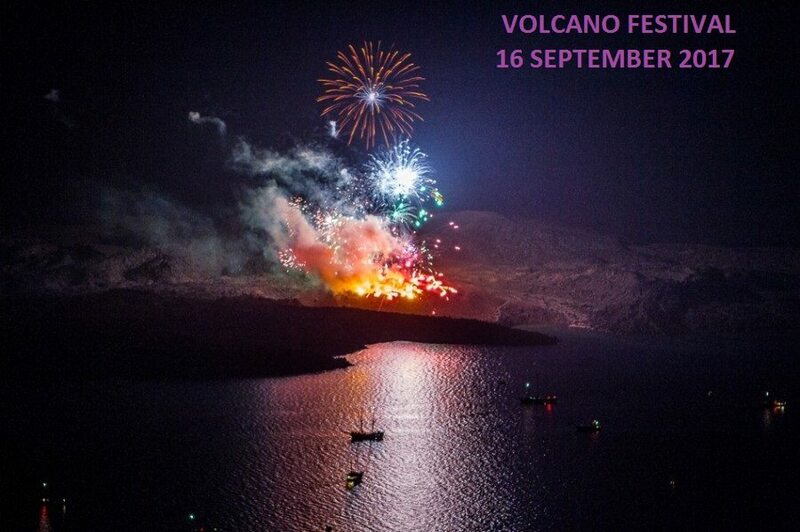 For 2017 the date for the Volcano Event (Ifestia 2017) in Santorini is the night of Saturday, September the 16th. So, what happens that night and what you need to do regarding not to miss a sparkle from this fireworks spectacle? First of all, you have to know that everything will be ready just when the sun sets. There is a breathtaking silence all over the caldera, and every spot that faces the beautiful caldera of Santorini is taken by people from all over the world and locals that want to enjoy this amazing show. The fireworks spectacle represents the volcanic eruption that created the amazing landscape of the caldera. It lasts up to half an hour and it is really once- in- a- lifetime experience to see the fireworks one after another to explode and light up the skies and the volcanoes! Where is the best spot to watch and indulge into the magic of this unique night in Santorini? If you are already in one of the caldera view suites of Ira Hotel & Spa, then the private balcony of your suite will be just fine as it looks straight to the show. Some delicious food and a bottle of wine from White Cave Restaurant will complete the night perfectly. If you live in a traditional cave dwelling then head to the swimming pool area or the terraces of the White Cave Restaurant to combine a dinner with the delectable tastes of our restaurant with the views to the fireworks coming from the volcano just in front of you! If you just want to enjoy this show then you can reserve a table by calling at +302286028835. The Volcano Event (Ifestia 2017) in Santorini is a night to remember and wherever you choose to spend, one thing is for sure, you will enjoy every single moment! All the details for bookings and reservations are at www.ira-hotel.com.